The historical Medina of the city of Rabat, capital of Morocco. 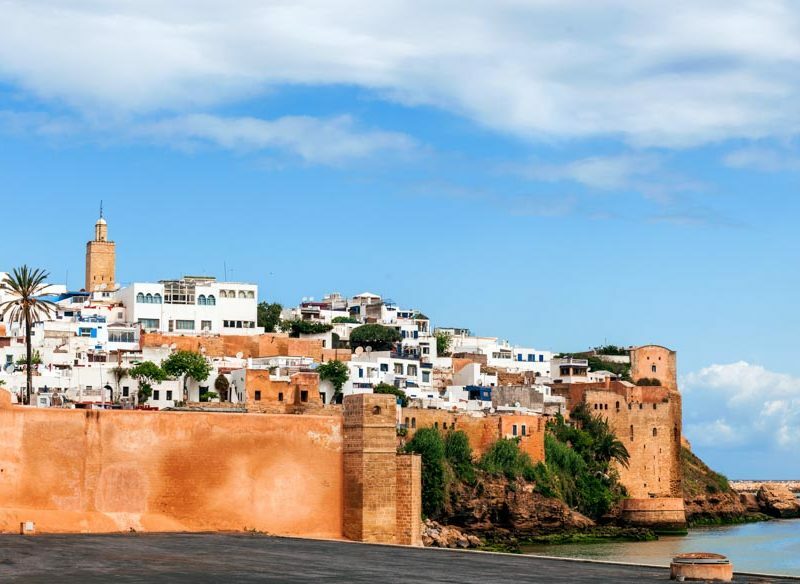 Look past the Moroccan greats of Casablanca, Marrakesh and Fez to discover Morocco’s capital Rabat, brim full of ancient treasures. When dining in Rabat you should sample the best of both the Moroccan tradition and the French colonial influence. A much-loved traditional restaurant can be found in the old medina. Dinarjat (+212 37 70 42 39) adds a little theatre to proceedings: you’ll be met at the medina gates by a man in traditional dress bearing a lantern who leads you through the labyrinth of old streets to the old wooden door of the restaurant. Mosque in the old town of Rabat, Morocco. Inside a 17th-century mansion you choose from a classic menu of lamb tagine, couscous and salads under vaulted ceilings. For a taste of France, head to Le Grand Comptoir. Housed in a restored 1930s Art Deco building, it has that Casablanca romance; a place of martinis, jazz and rare steak. 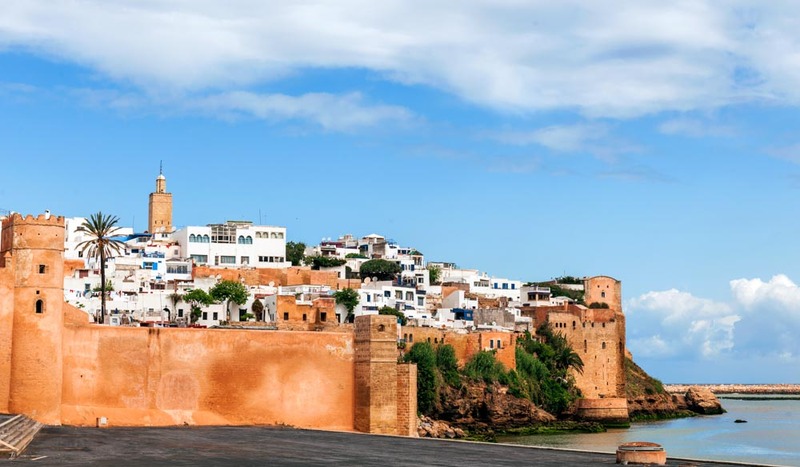 If you only have a day or two in Rabat head straight for the 17th-century walled Medina, a rabbit warren of streets that carry that old North African sense of romance and adventure. Dip in and out of the souqs and cafes and you could get lost, but not for long as you’ll eventually hit one of the ancient fortress walls. Head north up the Rue des Consuls past grand old courtyards before leaving the Medina and entering another of Rabat’s treasures, the beautiful Kasbah les Oudaias, through the spectacular Bab Oudaia gate. Relax in the Andalusian Gardens here and wander the narrow streets and blue-and-white walls of this 12th-century citadel that overlooks the Atlantic. Summer heat getting too much? There’s a lovely clean swimming beach right in the city. Make your way to the 14th-century Grande Mosquée de Rabat Medina, which marks the start of Rue Souika, a thoroughfare of shops with the reed-covered Souq as-Sebbat at its eastern end. Practise your bartering for Moroccan lamps, embroidered babouche slippers, jewellery and fabrics among baskets filled with bright spices and Turkish delight. Don’t miss the bustling souqs in the neighbouring city of Salé, a short taxi hop over the bridge that crosses the Bou Regreg river. Salé is known for its carpenters, who produce fine chairs, tables and trays. Moroccan women and children having fun on a sunny day at the Kasbah des Oudaias beach in the city of Rabat, Africa. Stop by one of the woodworking factories to pick up a gift. Looking like some alien obelisk, the Hassan Tower forms a striking edifice on the banks of the Bou Regreg river. The 44-metre high minaret, a slab of ornately carved red sandstone, is all that remains of Sultan Yacub al-Mansour’s effort to build the biggest mosque in the world, an attempt that was destroyed by earthquake in 1755. Take a walk in the surrounding gardens and then catch a five-minute taxi to Rabat’s other must-see sight, the Chellah. This medieval muslim necropolis was built on top of a Roman Fort. You’ll find the remains of a spectacular mosque here and the ancient ruins now play host to an annual jazz festival in September. Avenue Mohammed V is a tree-lined boulevard with plenty of shady spots to sit and have a coffee. Try La Comédie, which bakes its own pastries every day, and watch the world go by. Affordable: The Repose has traditionally styled suites in a lovely old riad in Salé’s Medina. Moderate: Riad Sidi Fatah is set in a traditional mansion in Rabat Medina. Luxe: With its own hammam, wellness centre and pool, the Relais & Châteaux property Villa Diyafa is the ultimate way to indulge after a day in the hot, crowded souqs.